The currency markets awoke from their brooding slumber overnight, if only to sit up and stretch, leaving the running shoes and gym gear sitting in the corner untouched. 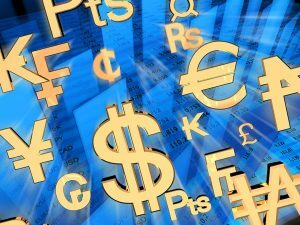 The eternal optimism in equity and energy markets finally spilled over as traders slowly but steadily sold the greenback, with the dollar index falling 0.37% to 97.04. Notable gainers were the euro (EUR) which rose 50 points to 1.1260 and the British pound (GBP), shrugging off Brexit-induced selling to rise 40 points to 1.3065, having dipped dangerously below 1.3000 on Friday. There was definitely a slow-news-day-look to the markets ahead of tomorrow’s European Central Bank rate decision and the FOMC minutes for March. Wall Street’s S&P and Nasdaq indices eked out minuscule 0.1% gains, while the Dow Jones fell 0.35%, weighed down by industrial heavyweights Boeing and General Electric. Escalating Libyan violence caused a bright spot for all the wrong reasons, fueling oil prices higher and lifting gold of the bottom of its weekly range. With the overnight session having a definite wait-and-see look about it across all three time zones, we can expect more of the same today as the data desert continues until tomorrow’s main event. Global recovery bulls can take comfort that the street appears to be choosing mild optimism rather than pessimism in the quiet times. It’s likely Asian markets will follow cautiously today. Following the gentle dollar sell-off overnight, as traders rotated into global growth plays from safe havens, we anticipate a positive start for regional currencies. Oils continuing ascent could see the Malaysian ringgit and Indonesian rupiah outperform during the session. Australian home loans are released this morning, and with a wobbly housing market, the number could cause short-term volatility in the Aussie dollar. The cautiously optimistic Wall Street session could see Asian traders collectively dipping their toes and sending stocks higher today. With no meaningful data on the calendar today, the markets will be vulnerable to news-headline-induced volatility. The escalating violence in Libya threw more fuel on oil’s fire overnight, with Brent Crude climbing 1.04% to USD71.10 a barrel. WTI rocketed 2.20% to USD64.60 a barrel as data showing falling deliveries to the Cushing oil terminal. Iran and Venezuela sanctions, Libya, Saudi Arabian production cuts; the list goes on of supportive geopolitical factors overriding the grossly overbought technical picture. Throw in optimism on global growth (real or imagined), and picking a high in black gold is a fruitless task for now. Gold staged an impressive comeback overnight fueled by a weaker dollar and increased China holdings, rising from USD1,292.00 an ounce to USD1,303.50 at one stage, before an equity comeback late in the New York session saw the yellow metal settle at USD1,297.50. If anything, this demonstrates that gold is moving on factors outside its control at the moment and the recent week’s price movements are not a gold story per se. Nonetheless, for embattled gold traders, the critical support level of USD1,280.00 withstanding the selling onslaught once again is a positive technical development.